The other comic book that my Uncle Jerry Blazer gave to me that summer Saturday was this issue of MARVEL TALES, reprinting a classic Stan Lee and John Romita issue of AMAZING SPIDER-MAN from the pinnacle of their run. This was the real stuff, and so surely this was the comic book that finally changed my ways and made me an avowed Marvel lover at long last, right? Sorry, no, not so much, I’m afraid. The thing of it is, my impressions of Spider-man and Peter Parker coming out of the SUPERMAN VS THE AMAZING SPIDER-MAN Treasury Edition were just reinforced here. For all of his troubles, Peter Parker seemed much cooler, much more plugged-in than I was or could ever hope to be. He was kind of intimidating in a way–and so I never quite bonded with him (and really wouldn’t until I read the original Steve Ditko-era stories.) 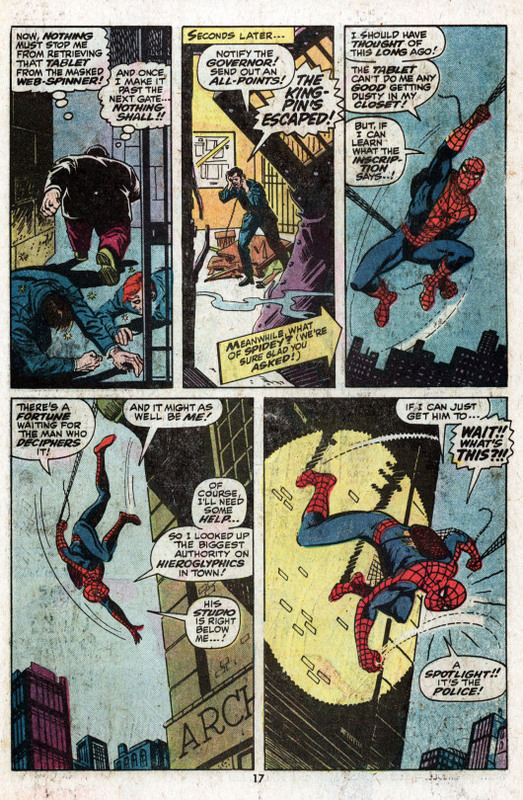 On top of this, Spider-Man was wanted by the law, which wasn’t a status quo I was covetous of. At this age, I wanted my heroes to be recognized for their deeds and actions, not hunted and hounded. The Kingpin, this particular issue’s heavy, also didn’t come across as a super-villain so much as just a big, strong criminal–he was less colorful than the Rogues that I was used to and loved. 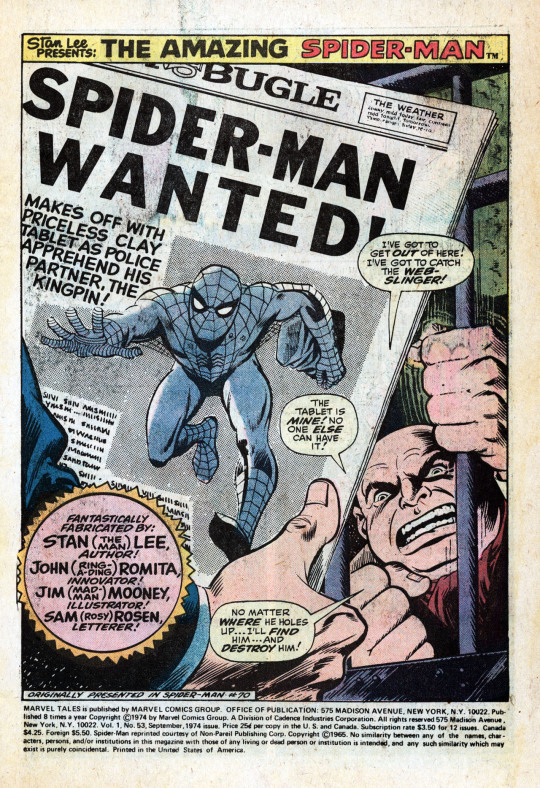 The story opens with the Kingpin in prison, railing about his capture and the fact that not only is Spider-Man still at large, but the wall-crawler had possession of the priceless stone tablet that the Kingpin covets, a tablet whose ancient writings contain a secret of enormous value. But the clever Kingpin has already convinced the authorities that Spider-Man was his partner in the theft, who had broken bad with him. And so, the entire New York police force is hunting for the web-slinger. Spidey himself is sick of being the fall guy and is contemplating keeping the tablet for himself–if he can figure out what to do with it. This momentary lapse, as human as it is, made me root for Spider-Man even less–surely a super hero shouldn’t be thinking about keeping the loot that his enemies have stolen! And it’s merely a passing moment of frustration. But it made an impact on me. Dodging trigger-happy cops all the way, Spidey makes his way back to Peter Parker’s pad, where he stashes the tablet and gets some much-needed-though-troubled sleep. 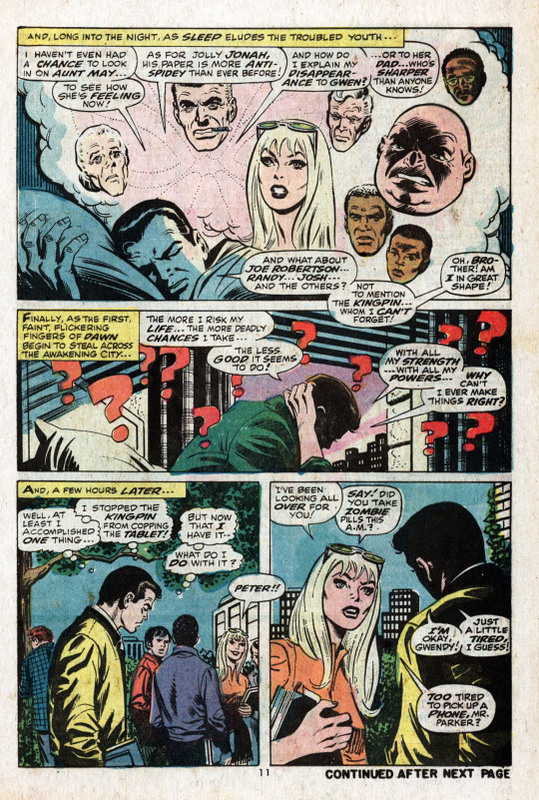 The next morning he heads out to Empire State University to attend classes, where his girlfriend Gwen Stacy gives him a world of grief for running out on her and Randy Robeton at the protest last night. Gen doesn’t realize that Peter had to become Spidey to prevent the Kingpin’s theft, so she’s understandably pissed, and storms away, calling Peter a coward. I must say, it may simply be down to Romita’s illustrations, but I liked Gwen immediately, and she’s always been Spidey’s one true love to me. 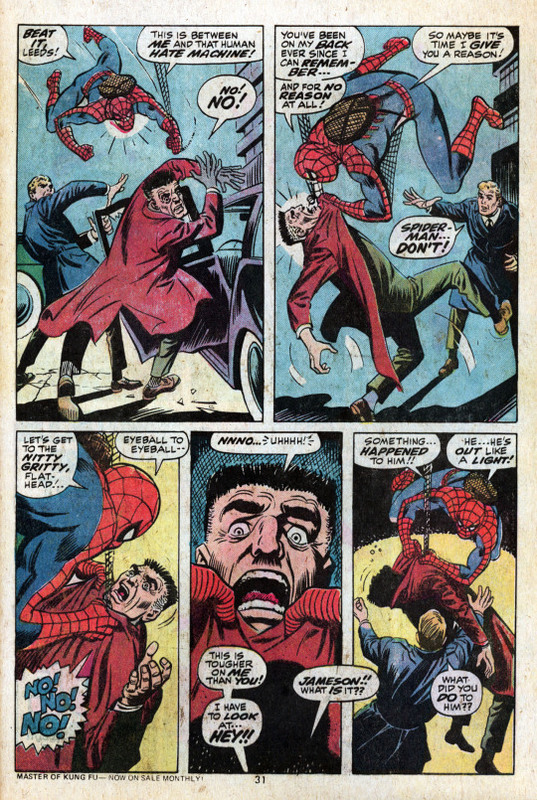 We spend another page or so on catching up with the rest of the cast: J. Jonah Jameson, Joe Robertson and his son, Randy, and Gwen’s dad Captain George Stacy. The protest plotline is wrapped up a little bit too conveniently–the Dean of Students the kids had been protesting was really in their corner the whole time, and just needed to convince the Trustees of the need for low-rent dorms. And so, everything is fine in those quarters. But back at the prison, the Kingpin tears his way out of his cell, and after disciplining some rowdy inmates who earlier had mad disparaging remarks about his wife, heads out into the night to find Spider-Man and the tablet. Meanwhile, as night falls, Spidey decides to take the table to an expert in order to get its inscription translated. But the cops are waiting for him, and in their run-in, he learns that the Kingpin has broken jail. 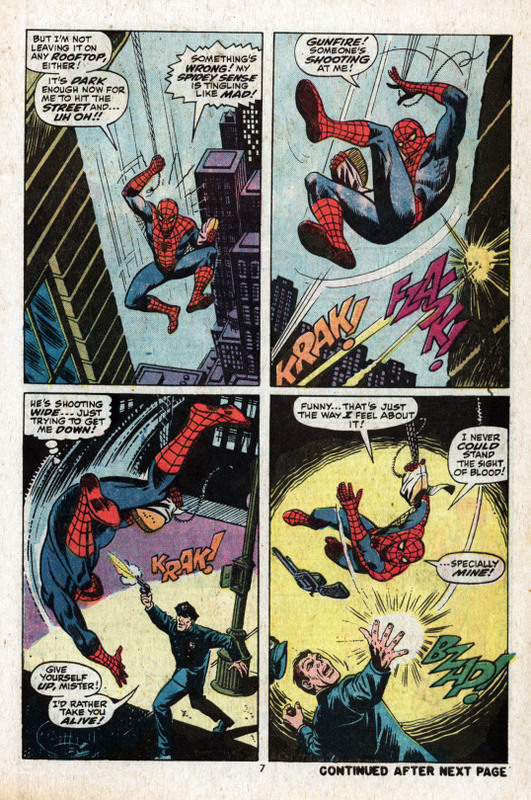 Spidey figures that the best way to lure the Kingpin to him is to mop up on hoodlums all across the city while carrying the tablet webbed to his back, which is what he proceeds to do. And sure enough, as the hours drag on, what looks to be a regular hijacking is instead a trap for the wall-crawler on the part of the Kingpin. 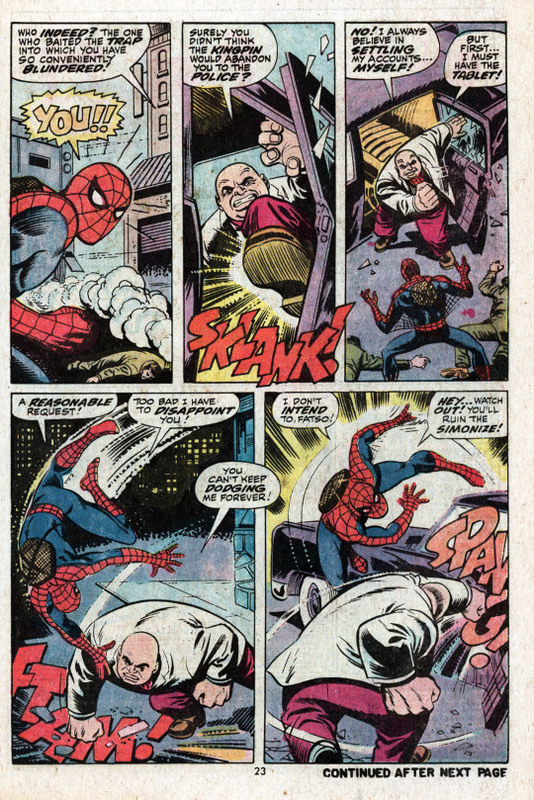 Spidey and the Kingpin mix it up for a few pages, with he fan man able to withstand all of the punishment that the web-slinger can dish out. But just as matters reach a crescendo, a car pulls up between the two combatants, driven by reporter Ned Leeds and carrying J. Jonah Jameson. The pause in the action provides a moment for another car to race up, this one driven by a shadowy woman–the Kingpin’s wife Vanessa hadn’t been shown yet, and was being played as something of a mystery. 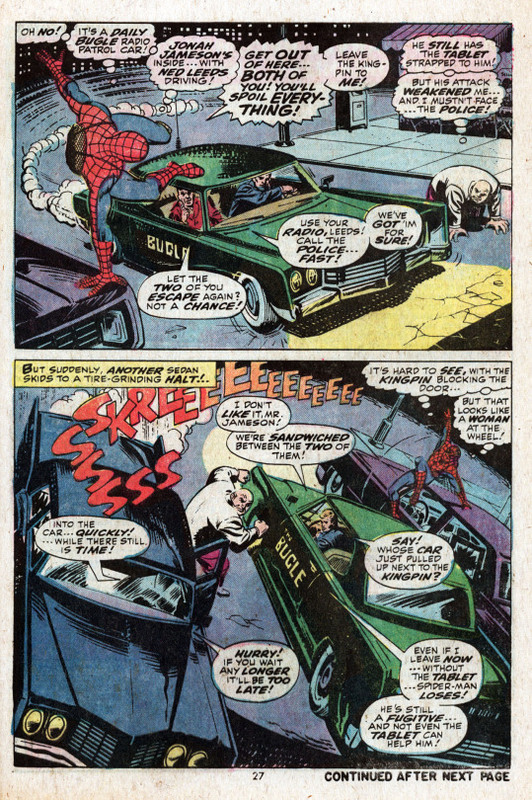 The Kingpin piles into her car and the pair roars away, while Jameson rails at poor old Spidey. And if nothing that had come previously had sealed the deal for me, this was the moment where any appeal that Spider-Man might have had for nine-year-old me disintegrated. Because Spidey snaps, losing his cool, and he grabs up Jonah and scares the hell out of him–so much so that Jameson has a heart attack right on the spot! The issue closes with Jameson either dead or dying and Spider-man racing off into the night, realizing that he may have become just as much a menace as Jameson always said he was. It’s a great moment of high drama–but it also colored my opinion of Spider-Man terribly. This wasn’t what I wanted out of mu super heroes at this age. And so, I remained a confirmed Marvel-hater–though I still kept the issue in my collection. 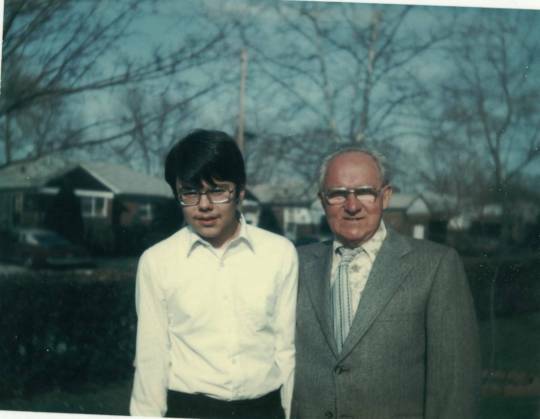 It had been a gift, after all, from my Uncle.